Sushi lovers would have heard of Sushi Mentai. Serving affordable and quality Japanese food to the masses, allowing all to enjoy Japanese delicacies against a modern and casual backdrop, Sushi Mentai has many branches naitonwide, with more to come. I was at one of their branch in USJ Subang the other day for lunch to try out some of their noms. Check out what we had that afternoon. At Sushi Mentai, authentic Japanese food is no longer an experience reserved just for the privileged – the restaurant serves superior ingredients and condiments mostly imported from Japan to treat one to a gastronomical fare. 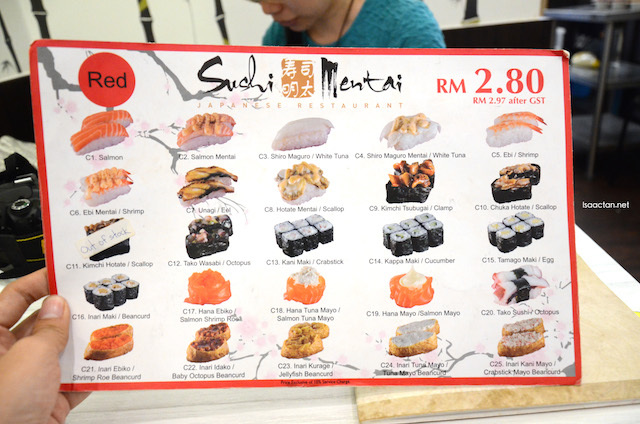 Did you know all the sushi from Sushi Mentai's menu either comes in a very low price of RM1.80 or RM2.80? How's that for affordability! Check out the menu pictures I've taken below, all you can eat at a low price. No wonder their outlets are always packed every day. Only RM2.80 per plate? Wow. Under Sushi Mentai's special maki roll menu, we found the Spider Maki to order. It came with generous portions of soft shell crabs, my favourite ingredient in any sushi rolls. I like the fact the soft shell crabs were crispy, with a tasty savoury flavour. Coupled with fish roe and their special sauce, this dish can be shared with a friend, or taken alone. Up next, we tried Sushi Mentai's signature dish, the Ebi Mentaiyaki. Relatively large tiger prawns were used in this yakinomo dish, with generous serving of mentai, lightly seared to give out that burnt mentai flavour. Love the marination and sauce, which goes well with the fresh tiger prawn. Recommended dish, and for RM9.80, I think it's pretty affordable too. Sashimi lovers should go for the Take, served in a bowl with a combination of octopus, salmon belly and white tuna. Served on ice, it's a refreshing dish, which doesn't have to break your wallet. Fresh, chilled and tasty, this is a must order if you have a thing for fresh, raw fish and seafood. For some variety, do go for Sushi Mentai's Tempura Moriawase. Served with sauce on the side, the dish contains 3pcs of deep fried tempura prawns and assorted vegetables. Love the prawns, more so the sweet potatoes and other vegetables. Perfect for those who love to have some deep fried crunchy noms. Overall, I left Sushi Mentai USJ Subang with a satisfied tummy, one which I will come back again, for their sushi and more. 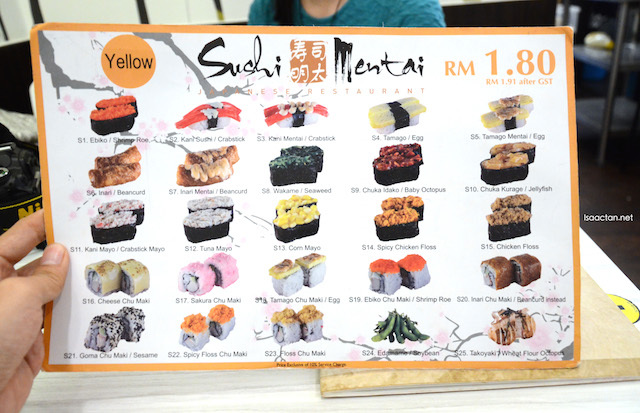 Do drop by any of their branches which can be found at http://sushi-mentai.com/our-restaurants should you be in the mood for affordable yummy sushi. I always love japanese food especially sushi! Yet to try out this restaurant but definately in my to-try list..
Isaaaaaaaaccccccc....bojio again. Lol. Love sushi. Hubby too. Got to try these out soon. wow in Subang USJ, need to visit some day. As not easy to find parking there. Whoa! so cheap...at least this is alternative for sushi king. The portion all look good! OMG!!! I Laaappp Uuu!!! I'm heading there this weekend!! TQVM!! Salmoooonnn..... 1.80.... 2.80... Some more so near!! RM1.80 & RM2.80 for a plate of sushi, that's cheap! I want to try Sushi Mentai long time ago!!! Have to find one day to try it!!! SASHIMI! very affordable and cheap. Bet its way better than sushi k***. haha. Cant wait to pay a visit. Thanks Isaac! Sushi Mentai is indeed really cheap though. There's one in SS2 which I have managed to try, though I didn't find it that superb, at least it's easy on the wallet haha. Ahh I love prawns!! Feel like having Ebi Mentaiyaki and the tempura now! sushi!!! Their sushi is quite affordable too <3 They have different outlet in KL area also right?